Maximize or minimize all windows or only IE windows. 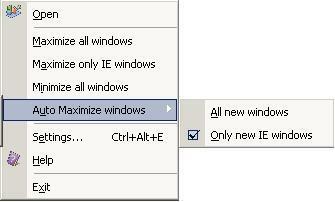 Automatically maximize all new windows or only new IE windows. Using Taskbar Hide you can hide any running application window. All you need to do is to select the application in the Taskbar Hide list and click Hide icon or click mouse right button to popup the menu and select hide item for the change to take effect. Taskbar Hide is also able to hide/show/close the program windows quickly through pressing a hotkey. You can hide some of the less used icons from the system tray. The operation is the same as to Hide/Show application windows. Now this function supports windows me/2000/xp/vista/7. You can arrange the windows on taskbar according to your preference. Select the application in the Taskbar Hide list and use Up and Down arrows to reorder the application windows. This feature becomes useful when you want to put related application windows together. You can select Always on top (topmost) or Normal (Non-topmost). The former places the selected window above all non-topmost windows, and this window will maintains its topmost position even when it is deactivated. The latter places the selected window above all other non-topmost windows but below all topmost windows. You can minimize any running application window to the system tray instead of an icon on your taskbar. You can bring the application window back to normal by using Show, or double click left mouse button on the icons or click right mouse button from the menu. You can select to hide taskbar or Hide/Show any of the following: taskbar, start button, task window, system tray, and time clock. You can find out more information of the selected window with the Window Properties dialog box. Such as window handle, class name, process id, thread id, window style and exstyle. 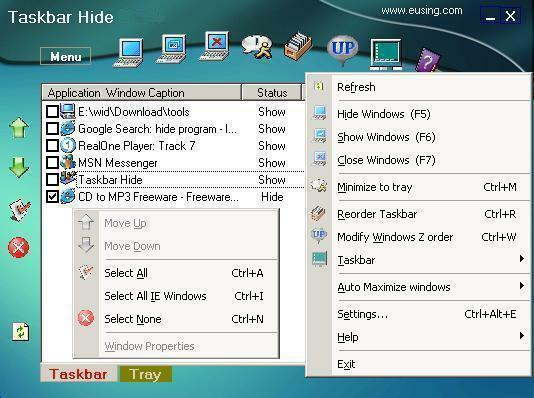 You can use Taskbar Hide to maximize all windows or only IE windows so that they cover the entire screen. Also you can minimize all windows to taskbar.